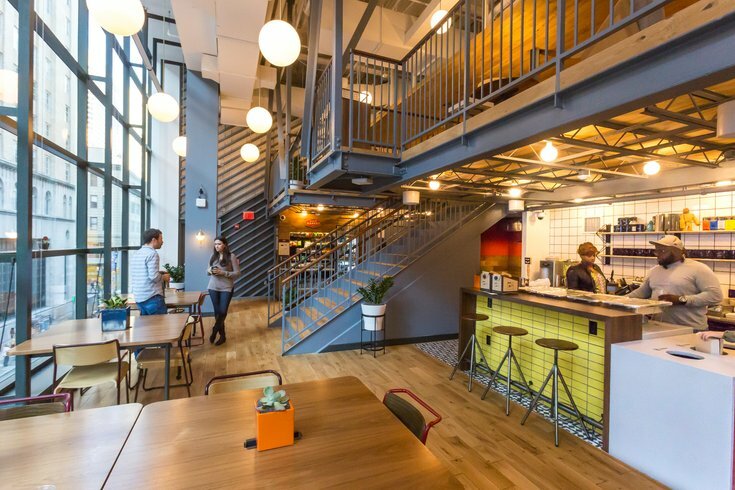 The second floor and lofted lounge areas, kitchen, welcome desk and mini market at the We Work coworking office space, 1430 Walnut Street. Forbes just released its ranking of the nation's 10 best rising cities for startups, giving Philly a place at No. 8, partially due to its "convenient access" to places that aren't Philadelphia. RELATED: Philadelphia International Airport ranked one of the worst large airports in the U.S. The Forbes ranking stayed away from cities already overly abundant in startups, such as San Francisco, Palo Alto, New York City, Boston, and others, focusing instead on markets based on cost of living and doing business, education, college presence, and other variables that seem to echo what Amazon is looking for in a second headquarters. The top-ranking city on the list went to Columbus, Ohio. According to Forbes, its cost of doing business is two percent less than the national average, though most other cities on the list are even cheaper. Charlotte, N.C., listed at No. 10, has a rate 12 percent below the national average. At No. 8, Philly, like Columbus, has a below-average cost at just two percent. Perhaps annoyingly to Philadelphians, Forbes primarily touts the city's proximity to other East Coast cities, saying, "Philadelphia offers convenient access to the East Coast hubs of Boston, New York, and Washington, plus more affordable business costs." Forbes also states that the region has more than 100 degree-granting educational institutions and has the second largest university population in the entire country. Take a look at the full Forbes piece here.